If you are in web development (as I am), and you also want to explore new applications in machine learning (as I do), you may be wondering, ‘do I have to wander spend time learning a whole new programming language to explore machine learning?’ No, in fact. Machine learning concepts can be explored with many different programming language and frameworks, including NodeJS. 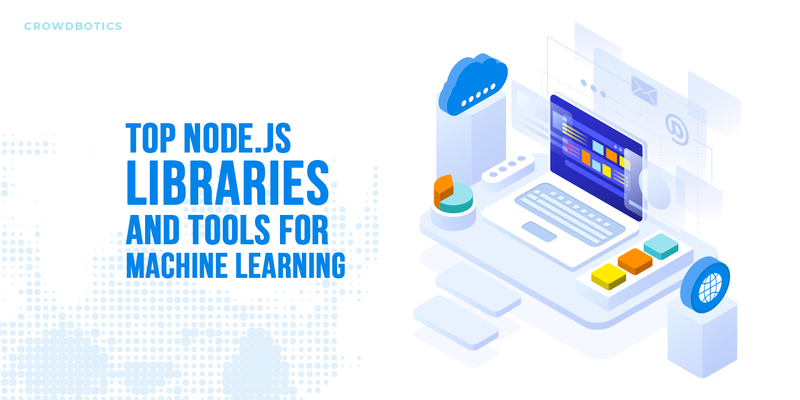 In this article, I review some of the top machine learning libraries for NodeJS to help you get started. This library is a collection of tools developed by the mljs organization. It includes a vast list of libraries under different categories such as unsupervised learning, supervised learning, artificial neural networks, regression, optimization, statistics, data processing, and math utilities. Most of the libraries that are included in ml.js tend to be used in a web browser, but if you are looking to work with them in Node.js environment, you will find an npm package. Each tool utility is available as a separate module so you do not have to install all of them at once, if there is no need too. All utilities that helps in transform and computing values using arrays are also packaged separately and are listed under ml-array which you can find here. For example, let us say you want to get a minimum value of all the inputs provided as an array. To do so, you will first install the utility ml-array-min . Then you directly require it like below. To see the vast list of libraries that are included in ml.js, visit the link below. This code creates a new network (net) and trains the network using an array of example. It thenruns the network with an input of [1, 0], which results in [0.933] . There are various meaningful machine learning applications that use Brain.js. Take a look at this one: Cracking Captcha with Neural Networks, in which the author uses captcha images for the dataset and uses image processing and Brain.js library to create a neural network that identifies each individual character. Another example of Brain.js being used with React Native can be found here. Check out the example below for predicting a next character in a stream of text based articles from Wikipedia using a long-short term memory. I can give you one more reason to choose synaptic over Brain.js. It has more API functionalities than the previous library mentioned in this article. This certainly means Synaptic will have more use cases and also, It is also actively developed. Limdu.js is a machine learning framework for Node.js that supports Binary classification, multi-label classification, feature engineering, online learning and real-time classification. It is currently in alpha state and looking for contributors. In the above example, an array as resource is provided to train the batch of key value pairs in the form of input and output. Serialization: you might want to train a classifier on your home computer, and use it on a remote server. To do this, you should somehow convert the trained classifier to a string, send the string to the remote server, and deserialize it there. Mutli-label classification: In binary classification, you get the output either as 0 or 1 . On multi-label, , the output is a set of zero or more labels. Try out the Crowdbotics application builder to instantly scaffold and deploy a Node app. It has its own REPL environment with integrated help and examples. 50+ sample datasets for testing and development. 200+ assertion utilities for data validation and feature detection. 200+ general utilities for data transformation, functional programming, and asynchronous control flow. Can be bundled using Browserify, Webpack, and other bundlers for use in web browsers. It is similar to Tensorflow.js in many ways. One of the similarities is that Keras has support for high-level APIs that take care of abstraction provided by backend frameworks. Using Keras, models can be trained in any backend and you can even hook Tensorflow for that. Another thing about these use cases are that all of them are written in VueJS. While much of the use case for this library lies in using directly with a web based browser. However, to use Keras with Node.js, there is one limitation you will have to be aware of: the Node.js models only run in CPU mode. Another flexible neural network library for Node.js, it uses matrix implementation to process training data. It does allow you to configure the network topology and use community made plugins. These plugins generally provide a way to configure pre-trained networks that can go straight to making predictions. Steven, the author, has written a 2 part tutorial on building neural networks by using Mind (Part 1 | Part 2). This series offer a lot more information than simply how to use Mind. Also, check out a live demo of a movie recommendation engine built with Mind. Natural is a library that provides tokenzing, stemming, classification, phonetics, tf-idf, WordNet, and string similarity. In other words, this library provide language facilities that you can use a module in Node.js. This is an interesting project with a variety of use cases. As it seems this library is still in early stages and most of the algorithms are English-specific but recent community based contributors have implemented support for other language such as Russian and Spanish. Another natural language processing that is only 230kb minified when used in the browser. It is an advantage of using this library as compared to the previously mentioned, Natural. This library provides lot of utilities that are basic and effortless, as well as support community made plugins to extend and use pre-configuration that allow adding vocabulary, fixing errors, and setting context quickly. Apart from English, support for languages including German and French is still a work in progress. Many machine learning library developers and teams write libraries using using C, LIBSVM, LIBLINEAR, and so on. These can be implemented in Node.js too, using native extensions provided by the Node.js core APIs. I hope, this post prove useful to you as well for learning and using different libraries mentioned in your Node.js application. If you’re working on a machine learning project using NodeJS, drop a link in the comments. I’d love to check it out.